Tornado™ Black Extruded Polyester strapping is an excellent choice of banding if you're looking for ultimate load stability. Strong and versatile, Tornado™ heavy-duty polyester strapping in black can be used in almost any application including timber, bottle, can, brick, paper, steel and corrugated industries. As strong as steel, yet 6 times lighter. 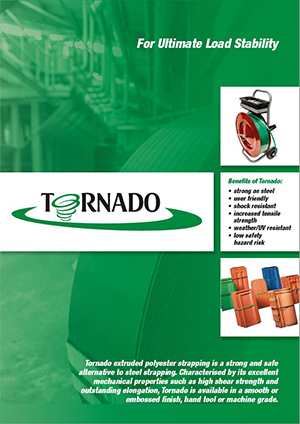 TORNADO™ is a premium brand of extruded polyester strapping. Proven for ultimate load stability - use this strong, heavy duty strapping for peace of mind. This versatile product can be used in almost any application including timber, bottle, can, brick, paper, steel and corrugated industries.